Hi friends, I have exciting news!!! Fishwater Tees in OKC, which is a company that has great products that I love, has designed a special shirt in recognition of my fight against Ovarian Cancer. They are donating the proceeds made from the shirt to the non-profit I am starting: Tenaciously Teal, which will continue to focus on encouraging Cancer patients and providing them with care packs consisting of items geared towards their special needs. In addition to making care packs, TT will continue to raise awareness for female Cancers, and provide support to other who are fighting Cancer. I love the shirt Fishwater Tees has designed and feel so blessed they have decided to help us spread Light in the midst of darkness. 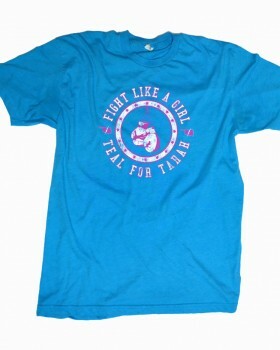 Go get your Fight Like a Girl tee today, and help Tenaciously Teal spread some love! !